Shell’s comedy-of-errors season of not-drilling in the Arctic drew to a close today as the company announced it was wrapping up ahead of its 24 September deadline. Shell was hoping that its $4.5 billion investment and multiple years of preparation would allow it to pierce the virgin seafloor of Alaska’s Chukchi Sea and squeeze out some of the 22 percent of Earth’s undiscovered fossil fuels believed to be underlying the Arctic and recoverable by current technology, according to the USGS. 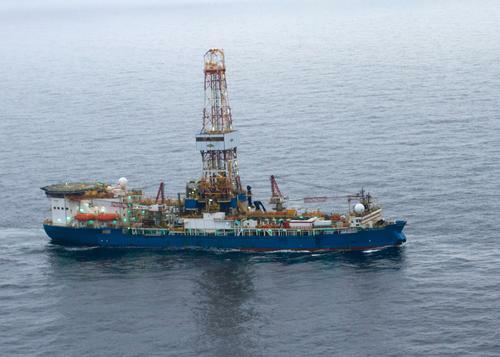 Their drill ship Noble Discoverer—seriously, that’s its name—sailed late from New Zealand. Remember Xena the Princess Warrior, aka Lucy Lawless, occupied the ship briefly in protest in February? The late start ate into a season already shortened by the US Bureau of Ocean Management. En route to the Chukchi Sea, Noble Discoverer ignobly dragged anchor in the port of Dutch Harbor in the Aleutian Islands under only 35mph of wind… a morning breeze in the Arctic. Drilling was delayed again because Shell’s primary safety vessel, the oil spill containment barge Arctic Challenger, wasn’t still being built in the shipyards in Bellingham, WA. Shell failed to meet some limits on air pollution emissions for its operations set by the EPA. Noble Discoverer got in 300+ feet of a thin pilot hole—the first drilling offshore in the Alaska Arctic in two decades—before it was halted the next day when a massive iceberg 30 miles long by 12 miles wide came within 105 miles of the drill rig. Also, damagingly, documents obtained by PEER (Public Employees for Environmental Responsibility) under a Freedom of Information Act request showed that original field-testing of the “capping stack”—a containment dome designed to contain a Deepwater Horizon type blowout—deployed on Arctic Challenger took place over a mere two hours on 25 and 26 June and was not verified by anyone other than two officials from the Bureau of Safety and Environmental Enforcement. “The first test merely showed that Shell could dangle its cap in 200ft of water without dropping it,” said Kathryn Douglass, a Peer staff lawyer, via The Guardian. “The second test showed the capping system could hold up under laboratory conditions for up to 15 minutes without crumbling. Finally that same “capping stack” was damaged during final testing off Bellingham, Washington, benching it for the remainder of the season… and ending Shell’s miserable Noble Discoverer season. Peter Slaiby, a VP of Shell Alaska, claimed: “The [Arctic] sea conditions in terms of the wind, waves and currents are not even as extreme as the North Sea, although, clearly, there is no ice in the North Sea.” Sounds like the prelude to dangerous hubris.